The Embassy of the Kingdom of Bahrain in the Russian Federation celebrated today Bahraini Women’s Day at the Embassy premises. 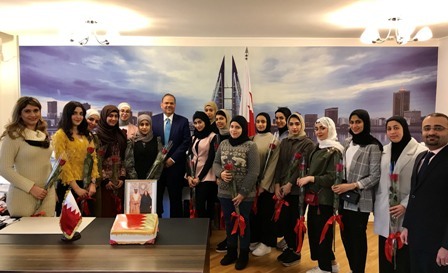 The Ambassador of the Kingdom of Bahrain to the Russian Federation, Ahmed Abdulrahman Al-Saati, honored Bahraini females studying at Russian universities on this occasion. He noted the role of the Supreme Council of Women (SCW), led by Her Royal Highness Wife of His Majesty the King and President of the SCW, Princess Sabeeka bint Ibrahim Al Khalifa, in empowering women at all levels. He added that this support led Bahraini women to contribute effectively to the development process in the Kingdom in the era of His Majesty King Hamad bin Isa Al Khalifa. The honored students valued the support of Her Royal Highness Princess Sabeeka to women and affirmed that allocating a day to celebrate Bahraini women reflects the keenness of the Kingdom to support women in order for them to take their role in the development process.